There are a slew of culinary-related holiday events in the next few weeks, so let’s dive right in. First up is the Holiday Local Market from 11:00 to 5:00 on Saturday. 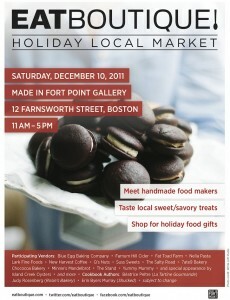 It’s in Boston but includes North Shore vendors Lark Fine Foods, Chococoa, and Blue Egg Baking Company. Go here for more information and to RSVP. On Tuesday the 13th at 5:00, Victoria’s Station is hosting the 18th annual Salem Children’s Charity event. All proceeds from the event (which includes food, celebrities, auctions, and surprise guests) go to the less fortunate school children of Salem. $15 cover charge per person. Rockport’s Christmas Pageant is taking place on Saturday the 17th, and the Emerson Inn is offering a three-course prime rib dinner from 5:00 to close for $33. They are donating 10% of the sales from this event to the Rockport Christmas Tree Committee. The are also offering a five-course New Year’s Eve dinner for $75 per person with selections like rack of lamb and shrimp florentine. 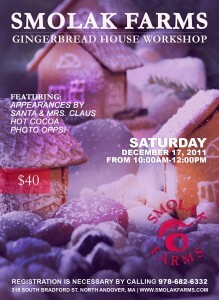 Also on the 17th, you can make your own gingerbread house at Smolak Farms in North Andover. The event is from 10:00 to 12:00 and costs $40. Call (978) 682-6332 to reserve a spot. The Hawthorne Hotel is holding a number of holiday events, including a Teddy Bear Tea on the 17th, Brunch with Santa on the 11th and the 18th, as well as Christmas Eve dinner and a Christmas Day buffet brunch. Some friends of ours celebrated Thanksgiving at the hotel and raved about it. Check their events page for details. Finally, the folks at Enzo in Newburyport are offering a traditional feast of the seven fishes on Friday the 23rd and Saturday the 24th. The menu includes house-smoked bluefish pate, lasagna with anchovy (a traditional Piemontese Christmas Eve pasta), broiled clams and mussels, and much more for $50 per person. Enzo is also planning a New Year’s Eve dinner where diners can select from one of four offerings for each course. Personally, we’re interested in the duck conserva raviolo with egg yolk, duck sugo, and crisp leeks and the crema fritta with chocolate sauce and gianduja gelato. The cost is $65 per person, and wine pairings will be available. One final note—we’d like to congratulate Lynn’s Blue Ox for being named one of the top 100 American fare restaurants in the US by OpenTable. Fantastic news! If you’re tired of watching those judges on TV taste all that delicious food prepared by chefs, Essex Clam Fest is the place for you. 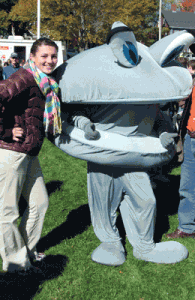 We had a great time on Saturday sampling eight chowders prepared by local restaurants and voting on our favorite. The lines were long, but the weather was great, and there was plenty to evaluate as we waited for our next sample. Although there was no chowder we didn’t like at all, there were definitely standouts. The ones that didn’t wow us included Lobsta Land (too watery, too much herb flavor) and J.T. Farnham’s (too thin, too buttery, too much pepper). In the middle were Shea’s Riverside (large clams but a bit too heavy and perhaps too much nutmeg), Emerson Inn (made with salt pork for great flavor, but it overwhelmed the seafood a bit), and Woodmans (good consistency, good flavor, but mushy pototoes). Our favorites were Ipswich Clambake (creamy but not thick, large clams, lots of perfectly-cooked potatoes, very good flavor) and Windward Grille (great seafood taste, perfect consistency, large chunks of potatoes and clams). Windward Grille was also the winner of the people’s choice award. Speaking of awards, Periwinkles won the judges award, and it was one of our least favorite samples, so we’re going to disqualify ourselves on that one. Our sample was very thick and tasted burned, so we’re guessing we got a bad batch. The tasting cost $5 and began at 12:00. We got there just about that time to be sure we’d be able to participate, but the tasting was still going strong until it ended at 2:00. 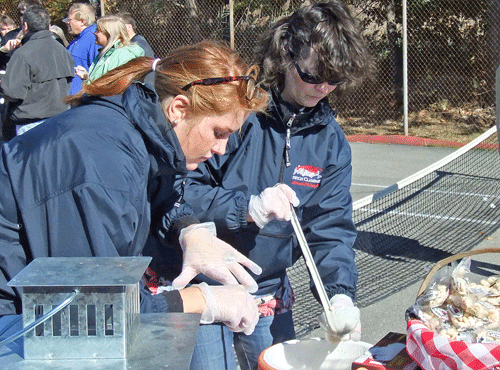 Several of the restaurants brought 40 gallons of chowder! With our bellies full, we walked the rest of the event, which included pony rides and other children’s activities, a variety of craft booths, and live music. 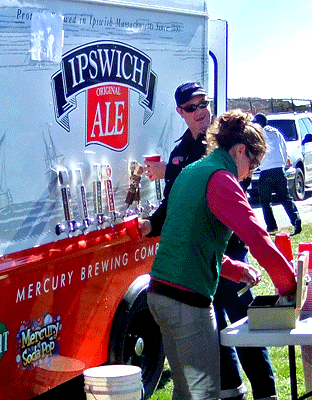 We were glad to see the Ipswich Ale Tapmobile, which carries eight taps ($4 per pint). Although their Pumpkin Ale sounded festive, we opted for the Stonecat Hefeweizen, which was bright and refreshing. Both Captain Dusty’s and Down River had ice cream stands set up. 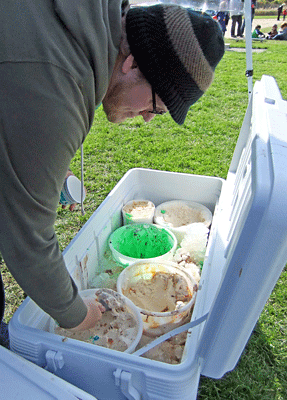 Along with the usual flavors, Dusty’s was serving samples of “cold clam chowder,” a truly unique eating experience. By the way, they’re opening for one day in December with holiday flavors like pumpkin pie and egg nog: 12/4 from noon to 4:00 at the Manchester location only. We love Dusty’s, but Down River is our absolute favorite, and they did not let us down. They were serving large portions in their delicious waffle cups for $3, and their caramel apple flavor is to die for. So if you have a secret desire to be a food judge, mark your calendars for next year’s festival, and in the meantime, get yourself to Windward Grille for a bowl of outstanding chowder.